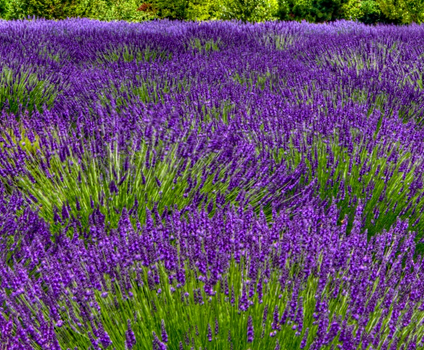 Organic Harvest - Our Lavender flowers are grown organically without the use of pesticides or other chemicals. Fertilized with organic manure from our own chickens, rabbits and little kinder goats, and watered from our private well linked to the glaciers of Mt.Rainier and filtered into the Nisqually River. Our Lavender flowers are hand picked, dried meticulously analyzed, tested for freshness, and aroma before we package and deliver to you. I purchase both the Certified organic and Organically grown to see if there is a difference. Well, there is! The organically grown is so fresh and smells beautiful. If you close your eyes, you would think you are were standing in the middle of a lavender field. I'm buying your organically grown herbs from now on! Very nice potent smell , Love this Co. !! I ordered a pound of lavender and it came with a very quick time. When I opened the bag it was so fragrant I could not believe it. For the price, service, and speed of shipping, this is the best place to get lavender buds hands down! So Glad I found this little piece of Heaven! AMAZING: I have been purchasing herbs from several different places over the years, and this little "ORGANICALLY GROWN" store is the place to shop. I opened my bag and couldn't believe the aroma. These flowers are so fresh and vibrant compared to other stores. Will be back again! I love how strong the flowers smell. Super soothing. Thank you for the speedy delivery! Click the button below to add the Lavender Flowers to your wish list.